Stuff in Italy isn’t exactly cheap. This was what I saw in a window some while ago. 146 euro? Thats almost 300 singapore dollars. 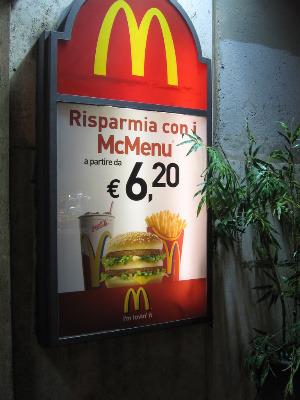 And this is what a Big Mac costs in Italy. Thats about $12 SGD. Yikes! Now that I’m unemployed a domestic goddess at the moment, I dont really have the liberty of spending money like I did before. Its beneficial to be a little more frugal. And one of the best way to save money is to buy and cook our own food. Over in Italy, there is a wet market where you can get your fresh produce from. My mum in law took me to one near her home during my first few weeks here. Just like in Singapore, there is a bustling of activities here from the customers to the sellers. You could buy all sort of things at the wet market – vegetables, meat, cheese, bread, even flowers, shoes and carpets! I was very excited to see such vibrancy here. Cart and I went the wet market at Piazza San Giovanni di Dio a while ago. I loved seeing all the colours there. I just wished that I wasnt so self concious to take more pictures of the sellers. Regardless, in the end, we could get two whole bagfuls of vegetables for about 10 euro. And with that, it completely stuffed the refrigerator and lasted us for a good two weeks. And oh boy, have I been having fun! Prior to this, I haven’t really been too interested in cooking since I’ve been happy to eat anything that my mum cooked. But now that I’ve been given the liberty to a kitchen for my own, I’ve actually been enjoying preparing food. This is Vegetable Curry. I made this! I was worried that Cart wouldn’t like it as I’ve never made curry before. But in the end, he enjoyed it so much that he took seconds. I was surprised! Moreover, I realise that cooking is actually very sexeh. Thanks to my new boyfriend, Gordon Ramsey. But I suppose good things comes with its own problems. I’m 64kg now. Ah crap. Sidenote : Just for fun, take a peek at my old video on how to make arrabbiata. Looking back, I realise how very unfluent I am in Italian. If Rinaz can cook, so can you! Start a cooking show series! u have minimum wage there too. so not fair to convert. the last i heard min wage per hour is 5 pounds per hour? I am jealous of cart!! The curry looks fantastic. Sigh looking at all these veggie foods makes me wanna go veggie too! Been meaning to comment and finally get the chance. Firstly, a big congratulations on your wedding! I am really happy that you’ve finally get to settle down. Now you can enjoy the bliss of being together with your very loved one. Lots of challenges ahead in the whole new world you’re in, I’m sure you’re aware, but hopefully more happy moments and experiences come along your way. Good photos! Now you got me hungry! Actually the shopping photos remind me of my honeymoon in Rome last May – was such bliss! 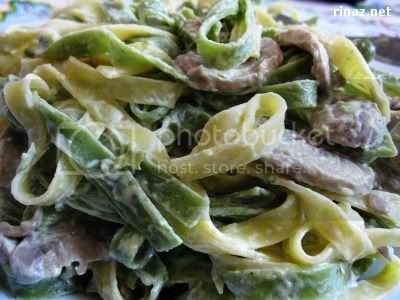 omigosh.. the creamy pasta looks awesome!!! Boleh! Anda boleh menjadi kaya raya! Yes, I know what you mean. Its a whole new world here to get used to, something very different compared to back in Singapore, with the different culture, the different language. Its takes time to get used to, thats for sure. Have you been to Porta Portese? Its an interesting market, they sell loads of things there. And its HUGE! It took us about 2 to 3 hours to see most of the shops. Since there is a minimum wage, which means the overheads are kinda fixed. So you can’t also expect the food to be as cheap as in Asia countries. A macdonald meal may cost dirt cheap in Vietnam but then you also need to consider the kind of wages they’re making. It’s all cause and effect. So my point is you can’t just compare the cost of something between countries, must also take into consideration the kind of money they’re making. I’m a fat boy with 173 cm height and 65kg weight. So you gotta start exercise. In Italy, by law you are required to get a certificate by the doctor saying that you are physically fit enough to exercise in a sports center. Gosh, its my first time hearing of such things. I understand what you are saying. The wage rate is more or less proportional to what they are spending. Take for example, a cup of coffee in Italy is 1 euro while in Singapore its 1 sgd. However there are some things which are not in proportion – case in point, my Wii costs about more or less, 400 sgd while in Italy it costs about 200 euro. Not everything is in that form of proportion. your vegetable curry look so enticing. Look so delish that i went on to tell hubby.. that i’m going to cook Vege curry for dinner tat night (whether he likes it or not) you see my hubby need some meat for meal. He cannot eat rice with just vege alone. Sedap… never tot vegetarian curry can be nice as..
Next PostNext Happy Women’s Day!